+ Printheads capable of marking variable data bar codes on secondary packaging. Because the OEM had already been using Matthews’ DOD print technology, they returned to Matthews for a new solution. 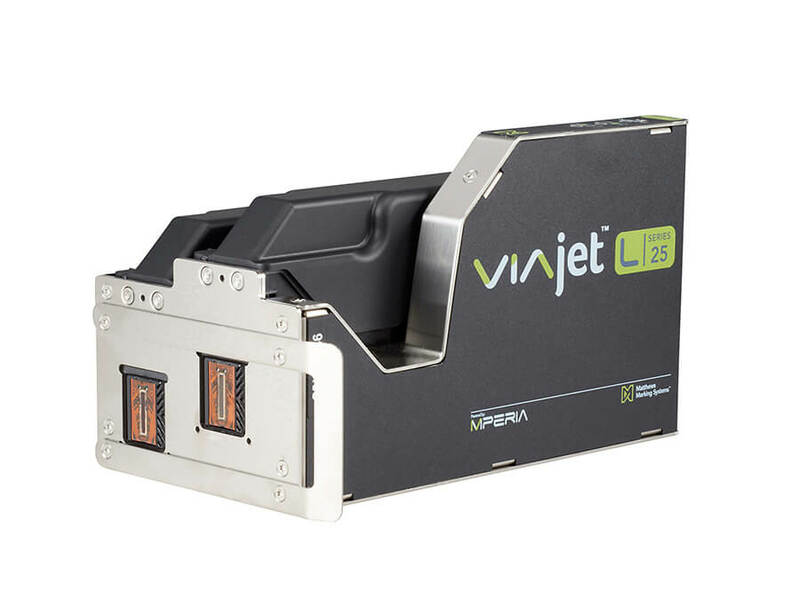 The decision was to replace the DOD printers with three to four easy-to-use VIAjet™ L-Series thermal ink jet (TIJ) L12 0.5-inch tall printheads per production line. The system marks variable data at a higher printing resolution (600 x 600 dots per inch) than DOD printers for maximum clarity, and at speeds up to 1,200 feet per minute. It also starts up and shuts down in seconds. Utilizing a cartridge-based ink supply, the VIAjet™ L-Series is inherently clean and nearly maintenance-free—no ink and solvent mixing required. Instead, an operator simply replaces the cartridge to refill the ink supply, a process that takes 10 to 20 seconds. Inserting a new ink cartridge removes the potential for clogs or spills, eliminating downtime required for cleaning. The ink deployed within the application is Matthews’ LS4050, developed with FDA-compliant and USDA-approved ingredients for marking the secondary packaging handled on the OEM’s production lines. The inks have been formulated entirely from U.S. Federal Food, Drug and Cosmetic Act (FD&C)-approved ingredients and U.S. Pharmacopeia (USP)-rated diluents. This ensures that FDA and USDA compliance standards for direct or indirect contact with food will be met by the production line owner. Finally, Matthews’ marking and coding automation platform, MPERIA®, directs the L-Series printheads and any other equipment in use at the OEM’s customer applications. It supports manual input of coding data via a touchscreen graphical user interface (GUI), or can interface with an operation’s ERP system. This permits automatic population of production data in real-time from new and existing order processing files and existing databases, as well as supports full traceability in the event of a recall.